Former Assembly Speaker Sheldon Silver was found guilty Friday on all seven federal corruption charges he faced, ending a retrial spurred by a United States Supreme Court ruling that changed the definition of public corruption, which led to Silver's prior convictions being vacated and prosecutors from the United States Attorney for the Southern District of New York seeking a new chance to convict the man who was for decades one of New York's most powerful elected officials. 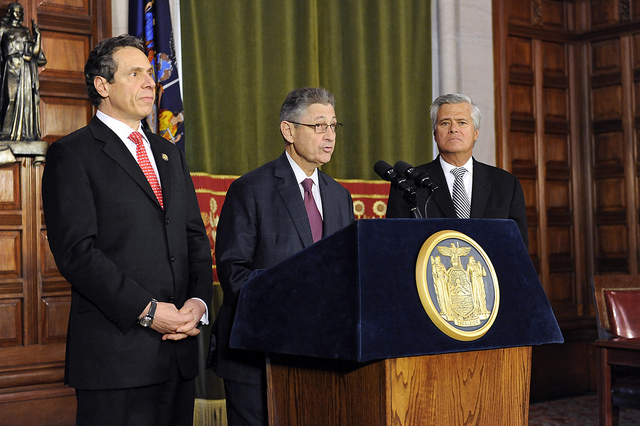 In recognizing the outcome, U.S. Attorney Geoffrey Berman said Silver "took an oath to act in the best interests of the people of New York State. As a unanimous jury found, he sold his public office for private greed." Silver was convicted of fraud, extortion, and money laundering, among other charges. In a very brief statement reacting to the verdict, Governor Andrew Cuomo said on Friday, "The justice system shows no one is above the law." 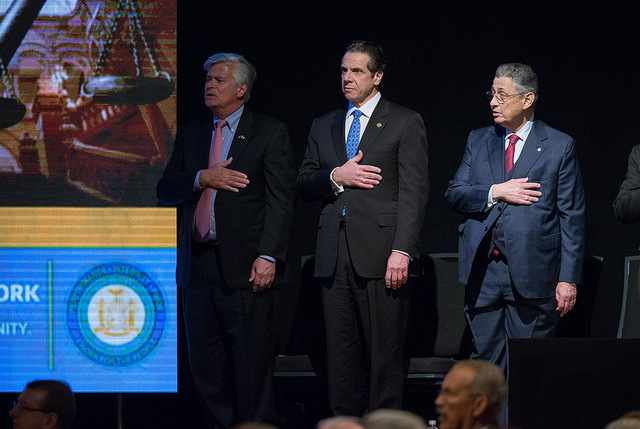 But during a Sunday appearance on NY1 television, Cuomo was asked about Silver's conviction and how it connects to other top government officials who have been found guilty of corruption, including Cuomo's own former top aide, Joseph Percoco. "I think the common thread is...that people will do bad, stupid, criminal, venal things. And that's society. 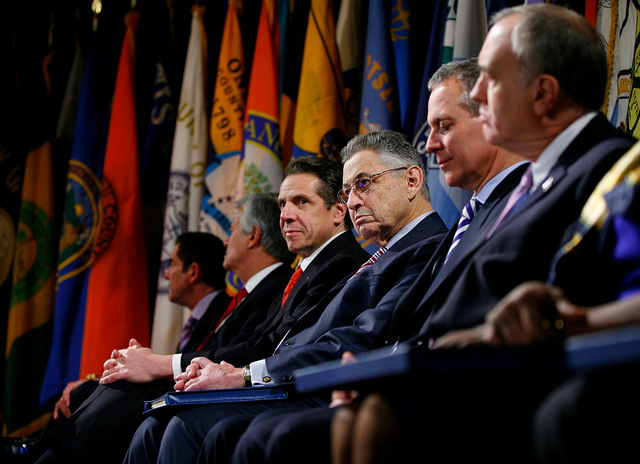 It's state government, it's local government, it's the federal government, it's the private sector," Cuomo said. "The question is do we have a system in place that finds it and corrects it? And we do. We should have, take confidence in that. Eric Schneiderman resigned the office. I went, moved very quickly to give my position which is that kind of behavior doesn't justify remaining in office and I called on him to resign. We then appointed a special prosecutor to make sure there is no conflict, no perception of conflict. And that's Madeline Singas who is the Nassau County District Attorney and a very experienced, proficient prosecutor in just these areas. So, my point is, will people do bad things? Yes. That goes back to Adam and Eve. Do we have a criminal justice system in place that says nobody is beyond the law or above the law? Yes, we do. 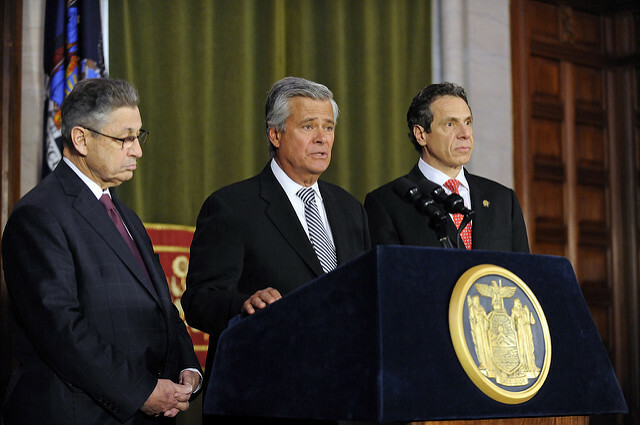 And that's why we moved so quickly for special persecutor on Eric Schneiderman who was the Attorney General. Top law enforcement officer in the state. And justice will be done and that's how the system works and were going to make sure it works that way." The retrial of former State Assembly Speaker Sheldon Silver on federal corruption charges neared a close on Thursday, with the jury beginning deliberations late in the day. Silver, a Democrat representing Lower Manhattan who was for years a pillar of New York politics, was convicted in 2016 on charges of honest services fraud, extortion under the color of official right, and money laundering in connection with two separate pay-to-play schemes. He was later sentenced to 12 years in prison, but his conviction was overturned after the Supreme Court’s decision in a separate corruption case redefined what constituted an “official act” that an elected official would have to take in exchange for money or services in order to be guilty of abusing their office. The vacated conviction prompted a retrial. In federal district court in Manhattan on Thursday, prosecution and defense attorneys made their closing arguments to the jury, recapping a week-and-a-half long trial that saw 26 witnesses testify and a mountain of evidence presented. Like in the initial trial, Silver did not take the stand in his own defense. 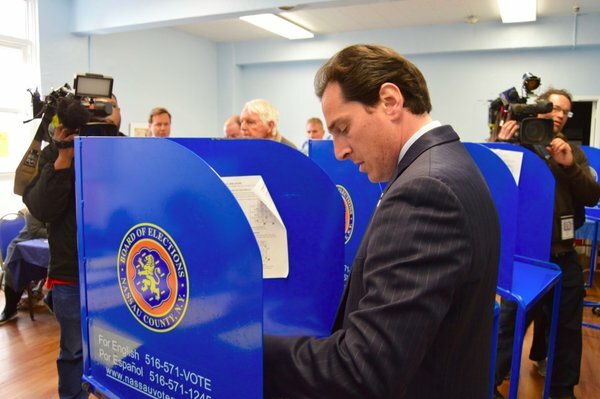 The case was argued this time by different prosecutors, as there has been significant turnover in the office of the United States Attorney for the Southern District of New York since Silver was first charged under the leadership of then-U.S. Attorney Preet Bharara. Over the course of nearly three hours, assistant U.S. Attorney Tatiana Martins laid out the case against Silver, detailing the two schemes that he used to enrich himself. For the most part, both the prosecution and the defense agree on the details of the case, but only the prosecution believes Silver’s behavior was illegal. “What the defendant did to line his own pockets wasn’t just wrong, it was criminal,” Martins said. Both schemes, Martins noted, involved the same modus operandi -- referrals for cash. In the first scheme, Dr. Robert Taub, a former Columbia University researcher who was a prominent witness at the trial, directed mesothelioma patients to Silver who then referred them to his law firm, Weitz & Luxenberg, for hefty referral fees -- totalling $3 million for 48 patient referrals. In exchange, Silver directed $500,000 in state grants to Taub’s clinic and took other actions favoring Taub’s family. “Dr. 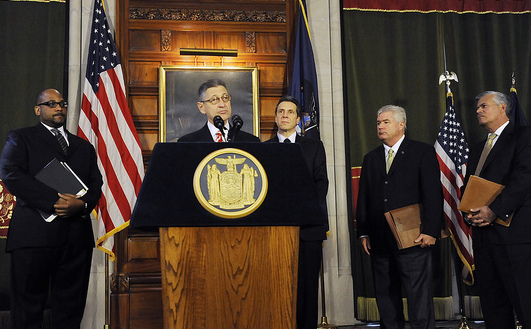 Taub was Sheldon Silver’s golden goose and Sheldon Silver did whatever it took to keep getting Dr. Taub’s golden eggs,” Martins said, in outlining the alleged quid-pro-quo. The second scheme involved Silver nudging two real estate firms -- Glenwood Management and the Witkoff group -- to send business towards a law firm, Goldberg & Iryami, which gave a 25 percent cut of the money to Silver, about $800,000 in total. In turn, Silver allegedly used his office to advance legislation and approve massive state tax credits that benefited the firms. Silver faces three charges from each of the cases -- honest services wire fraud, honest services mail fraud, and extortion under the color of official right. He also faces a seventh charge of money laundering, stemming from his use of his allegedly ill-gotten gains to invest in blue chip stocks. Silver corrupted his office, Martins said, “turning his official power into a cash cow to line his own pockets.” She noted that Silver repeatedly lied about these various sources of income, failing to report it on annual disclosure forms required of state legislators. And she insisted that the defense’s arguments were a “red herring” meant to distract the jury. Silver’s defense attorney, Michael Feldberg, sought to poke holes through the prosecution’s theory, broadly insisting that Silver’s actions were far from violating the law. 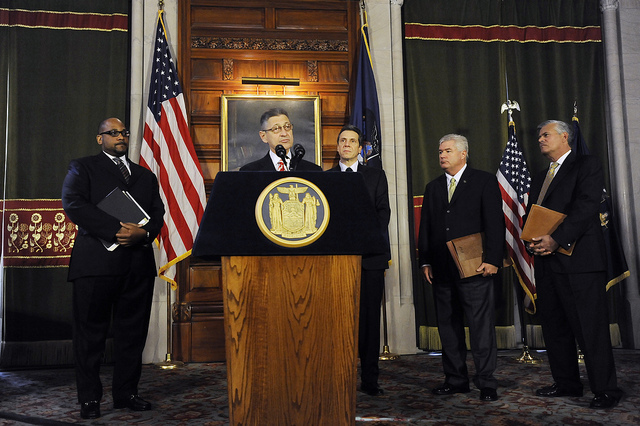 “It is perfectly legal for New York Assembly members to earn outside income,” he pointed out in his closing. In both schemes, Feldberg insisted that Silver was simply earning income as a lawyer, which was declared on his disclosure forms, and that referral fees for the type of work Silver was doing are a “common, standard and accepted” practice in the field. New Yorkers may not like some of the practices involved, Feldberg argued, but that does not mean they are illegal. “We’re not arguing that Shelly is a perfect man...We’re not arguing that he’s a saint,” he said, impressing upon the jury that even if Silver’s actions were “unseemly,” they were not enough to find him guilty. Following a relatively short rebuttal from the prosecution, Judge Valerie Caproni read the charges to the jury, which then headed into deliberations briefly before the day was over. Jury deliberations will continue on Friday. Now, she must navigate growing into her role as an elected official, managing constituent services in a district that once got special attention given Silver’s powerful perch, and making her mark on Albany’s crowded landscape. 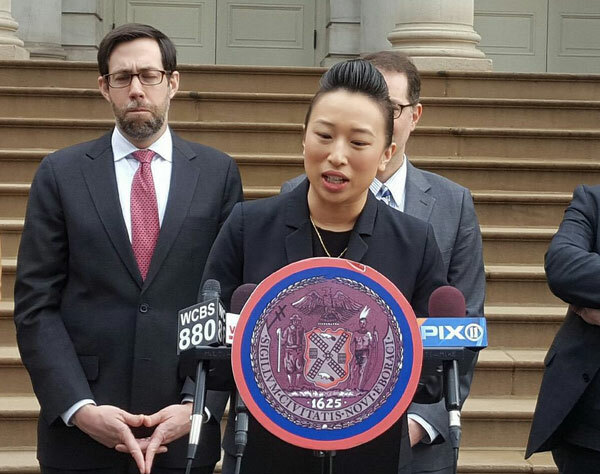 In February, Nious spoke with Gotham Gazette about the challenges of meeting the outsized expectations of her district, getting to know her new colleagues and figuring out how to be heard in a notoriously dysfunctional state government. She also shared some of the less glamorous aspects of being a new legislator from New York City, such as taking the train to and from Albany and ordering pizza to her hotel. GG: How was your first month as a state legislator? What was orientation like? YLN: The first month has been pretty hectic. It’s been exciting in a lot of ways, but it’s also a lot to take in. It’s a pretty steep learning curve, because everybody else seems to know what’s going on a lot more than I do. It’s been also really exciting to get to know a lot of my colleagues. My cohort -- it’s very exciting for us to be together, because we’re all freshmen together, and there’s about 11 of us on the Dems side. It’s been kind of fun, that part of it...There’s a lot of folks that just listening to them talk and understanding some of the issues that they are fighting for, I admire them. GG: What’s your commute like? Where do you stay? Favorite restaurants? Tell us about your day-to-day. YLN: Actually, because there’s been so many events going on in-district, I commute Sunday night and I take the latest train usually. Sometimes it’s 9 p.m. and sometimes 11 p.m. I take the Penn Station Amtrak, and usually when I get [to Albany] it’s around midnight, or if I got the 11 o’clock, it’s like 2:30 a.m. But I try to go to as many district events as possible before I leave; because we’re up here, we don’t to get to be in the district as much as we would like and people want to see me out there. But because of the schedule and how busy it is is [in Albany] -- It’s almost budget season, it’s actually the last day for budget letters -- everything is really hectic. I’m staying at the Holiday Inn Express — very fancy! — I actually have not gone out to eat at all really. Sometimes in the dead of night, when we finally get done with everything, it’s like 11 p.m., and everything’s closed. I go back to the Holiday Inn, and then I order pizza. GG: Have you had much Assembly floor time? Do you speak up for your constituents? YLN: It’s really great, because they help us by putting things into packages and days. So there hasn’t been much difficulty with drafting policy or the legislative schedule yet. I think that things get full and really crazy fast right after the budget is done — for the policy side. Right now, we’ve done a lot on women’s rights and I was able to speak up on reproductive health. We had a bunch of resolutions heard. Mine was the Lunar New Year resolution, and it was really great, because over 80 legislators signed on to it. We also had the immigrant rights debate, a lot of criminal justice reform debates. So those were really impactful right now, because of what’s going on on a federal level. GG: You are coming in during a strange climate given what’s going on nationally. How has the Trump administration shaped your priorities? YLN: That a really big question. One of the things that I’m lucky enough to be a part of, is being part of ‘the people’s budget,’ I’m one of the legislators who is helping to put it together — and that’s the document that the Black, Hispanic, Asian and Puerto Rican Caucus put together. It’s really exciting. We get to talk a lot about the things I just mentioned, with criminal justice reform, and immigrant rights and women's rights. And we get to talk a lot about what we, as a caucus, would like to focus on. The other budgets don’t necessarily make those things a priority, so at least it’s a document for folks who believe in those things to have a voice. It’s a very exciting project and I’m really honored to be a part of it. One of the pieces -- because of the weird climate -- one of the things I got to speak up on, was stopping data registries, and I think that’s really important because I know the city is going through some stuff with the [IDNYC (municipal identification card)] program. We are all trying do our best to look at what’s happening, and then do really good preparation to be a good buffer and good representation of our district. GG: You get this question a lot, but, Asian-Americans have been underrepresented in public office in New York State for so long. As the first Asian-American state legislator representing Manhattan, is there a lot of pressure to be a voice for an entire ethnic group? YLN: I worked for [Assemblymember] Ron [Kim] last year and he was the only Asian-American on the entire state level — I bet he felt that! Right now, there’s both me and him, and it’s nice. 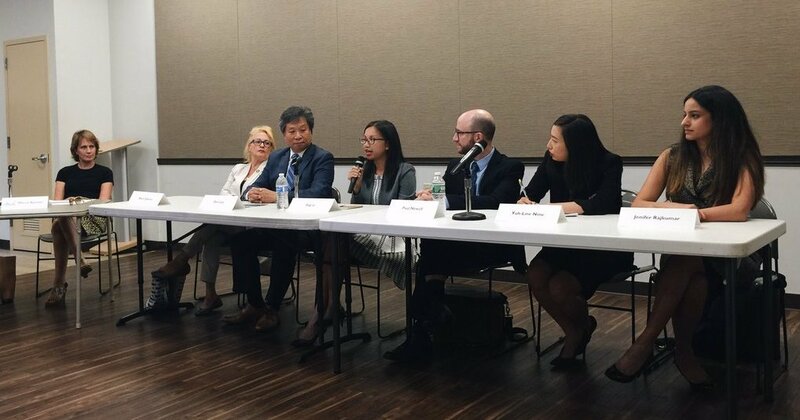 But I also know that there are many of our colleagues that have very large Asian-American populations, and many of them have been very good at representing those communities in those districts as well. But yes, of course, a lot of people are going to come to our office with a lot of language-access needs, and immigration issues, and things like that. Just very basic things, like how to use mail. These are things Ron and I had to deal with that a lot at his office, because he was the only Asian-American elected on the entire state level, so many times a lot of those issues came to us. I don’t get tired of the question, by the way. I think it’s sad that we have to keep asking the question more than anything. Because, I think that you are right, absolutely, we are the most underrepresented minority in New York State and the most rapidly growing as well in our state. We are at least 10 percent of the population in our state and we definitely don’t even have 1 percent of representation on a state level. That’s shocking, for sure. I think it's upsetting in the sense that, ‘Oh, I can’t believe I am the first on a state level,’ because I didn’t think that that was still a thing, but unfortunately, it is. I think it's very important to represent my whole district, but it is also a community that grew together, and everybody is supportive of one another. That’s why it’s such an incredible district. GG: Any other surprising moments or takeaways from the past month and a half? YLN: There hasn’t been anything completely unexpected, but I definitely have just been just moved by how supportive everyone is. 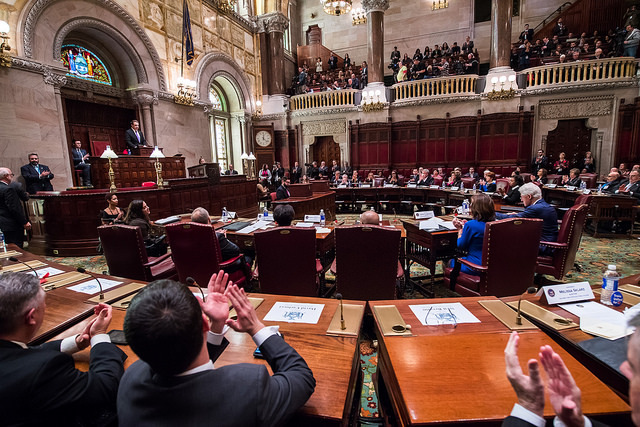 Especially with my office, the speaker [Assembly Speaker Carl Heastie] has been very, very good with my district and understanding the difficulty that I am under. Given the history of this office, I think that we know that this district was serviced like no other district, because there were a lot of resources that, having the former speaker represent the district, that the district would have. Certain expectations have been set by the seat, which means I have to provide a very high level of constituent service and representation, but with only a fraction of the budget. I was very moved and surprised by how much the Speaker understands that, and by how supportive the staff has been, on [The] Ways and Means [Committee], and the different committees, how they’ve been for our district in general, because it's got to be a drastic change. I think it's my responsibility to the district to ensure that I’m super responsive, that we are able to get to folks’ needs very quickly and efficiently, because it's crucial. This is a constituency that literally had the most service and then almost no service for a period of time. It’s been a shock to the system. I’m hoping to make sure we are 100 percent accessible, that we are always transparent, and my priority is always constituents first.